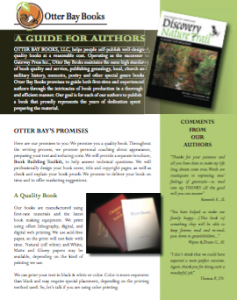 I’m delighted that you have contacted Otter Bay Books. We look forward to being your partner in producing your special book. We will listen to your unique situation, explain the preparation and printing solutions that might work for you, and support you in the choices you make. START HERE with our free Guide for Authors that explains the basic steps of publishing and describes some of the options you may choose from. WHEN YOU START FINAL COPY PREPARATION – please request our Book Building Toolkit brochure. It will support you as you set up your files for publication. It is geared to people who are using Word and will help you with setting up your book size and text area, headings, page numbers, scanning photos, inserting photos in the text, etc. We welcome you to our family of future authors and hope to hear back from you soon!